Coffee; our early morning kick-start and late night buddy. For the real coffee lovers, the coffee machines, coffee beans, and the brewing process are not the only things that matter; a great coffee mug is part of the routine. The coffee cup creates the mood as you sip your coffee during work or as you study. The latest, cultured and quite luxurious cups in the market are the glass coffee mugs that surpass the traditional coffee cups which, to be honest, were a bit objectionable as they lacked proper insulation and were of lower quality. Glass coffee mugs create a pleasant experience as you drink your coffee and, to share this experience with you, we dug through coffee glass mug features and come up with a list of high quality glass mugs for you. Keep reading, and you might find yourself an excellent coffee bearer from the list below. The 5.4-ounce coffee glass mug is especially suitable for those morning espresso shots to get your day started. It comes as a set of two nicely wrapped glass mugs which you can even get for a friend or family as a gift during that special occasion. The JoyJolt Savor coffee mug is uniquely hand-blown to produce a well-rounded double-walled borosilicate glass mug. The double wall creates insulation making the glass resistant to heat and condensation. This means that your hot or iced coffee will remain at the desired temperature long enough for you to finish your coffee. Due to its excellent insulation, the handle stays cool to give you a comfortable time as you take your coffee. Borosilicate glass is quite strong compared to regular glass which increases the durability of this coffee mug. It has a smooth crystal clear finish which enhances the enticing nature of this mug. 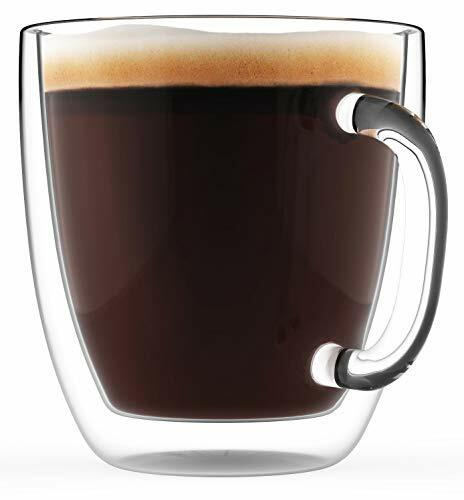 The Libbey Irish coffee mug has a significant coffee capacity of 10.5 Oz which keeps you going for longer. It comes in a set of four pieces which is an exceptional addition to your home or coffee shop. Its crystal clear glass gives you a clear view of your favorite coffee. Libbey is known to produce high quality mugs, and this is one of their most innovative yet. Its handle is just at the right position to ensure that you sip your coffee comfortably. Due to insulation, the handle does not conduct heat to ensure that your hand stays cool. It’s made of high quality thick yet light glass which makes sure that the mug is durable to give you service for years. 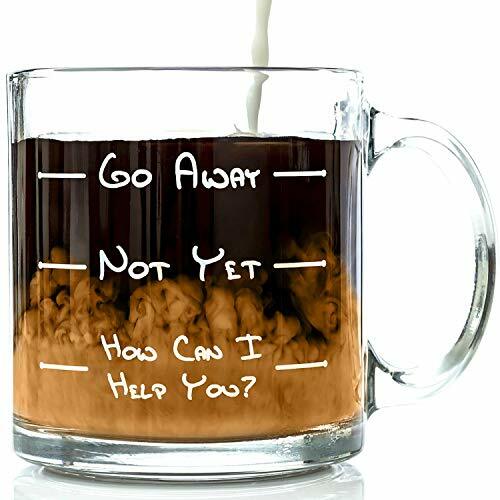 The Go Away Glass Coffee Mug is one of the many funny mugs from Got Me Tipsy coffee mug company. It’s an excellent way to have coffee in the office or at home as you create a humorous environment for you and your friends. This mug is made of thick, sturdy glass making it durable and sturdy to make sure it serves you for long. It holds 13 ounces of coffee making it perfect for those long hours. The glass used to make this coffee mug is condensation resistant to make sure your coffee retains its temperature. It has a good grip which does not conduct heat to make sure you take your coffee without freezing or burning your hands. This combination of the funny inscriptions, the capacity of the mug, and the packaging make it perfect for a coffee lover gift during the holidays or anniversary. If you want to sit and enjoy your coffee without running for refills every few minutes, then this glass coffee mug is for you. It has a capacity of 12 ounces for you to enjoy a huge caffeine supply at once. The Stone and Mill double wall coffee mug are hand-blown to make sure they produce a well-insulated glass to guarantee your coffee stays at your preferred temperature. The double wall glass makes your coffee appear elevated giving you an extra touch of elegance. Lead-free borosilicate glass -high quality glassware- is used to make this coffee mug. This makes it abrasion and shatter-resistant increasing its sturdiness. It comes as a set of 2 well wrapped glass coffee mugs for you to share its sophistication with a friend or family. This double wall glass coffee mug is rather distinctive because it’s built with a permutation of attractive optical effects, huge coffee capacity, and high quality. It’s hand blown to attain the perfect design for you. The JoyJolt Caleo coffee glass is composed of lead-free borosilicate glass which is strong, durable, and condensation and heat resistant. The double wall creates an insulation to ensure that your coffee retains heat for a longer period. The mug’s handle fits perfectly in your hand and remains cool due to the insulation which prevents any conduction of heat keeping you comfy as you sip your coffee. It has a capacity of 13 ounces to ensure that you keep enjoying your coffee for longer without standing up now and then to get fill-ups. This makes it perfect for those long working or studying hours. Imagine how superb your friend would feel if you gave them this as a gift. They come as a pair packed in an elegant gift box, and they make quite a unique gift. 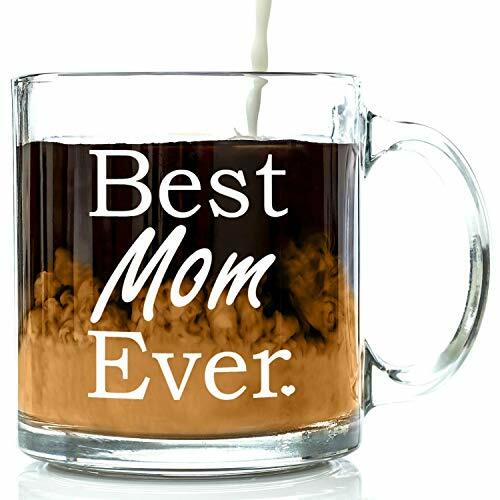 Best Mom Ever glass coffee mug from Got Me Tipsy is the perfect gift to get your coffee loving mom anytime. It has a beautiful Best Mom Ever design on both sides on the glass creating a beautiful and unique glass mug. The mug is composed of high quality sturdy glass. This makes it durable and suitable for both hot and cold drinks. It has a capacity of 13 ounces making it perfect for the time your mum wants to relax and have coffee without having to refill after a few minutes. The glass is thick to make sure it’s sturdy and that it does not lose heat fast. Sun’s exceptional quality thermal glass is carefully crafted to produce the Sun’s double walled glass. The double wall creates an insulation to keep your drinks hot and prevent condensation when consuming iced coffee. The glass has a capacity of 9 ounces making it quite useful for taking an espresso or for an Aero Press. Although the glass has no handle, it’s suitable for taking both cold and hot drinks while keeping your hands cool because of the insulation between the inner and outer glass. This coffee glass has an old fashioned touch of sturdy yet simple glass. It has thicker walls than most double walled glasses meaning it has higher durability. The quality of this glass can handle a microwave, dishwasher, or a freezer expanding its usage capabilities. As the name suggests, this glass coffee mug has a huge capacity of 16 oz. Just fill it with your favorite coffee, and you won’t have to stand up for a refill for a quite a while. Most people worry about getting a big coffee mug because of their coffee getting cold before finishing it. 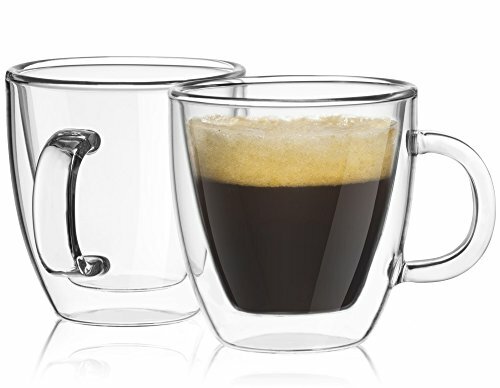 With this glass coffee mug, your coffee maintains its temperature because the double wall provides insulation. If you take hot or iced coffee, it will retain its temperature for a long time. Simply put, its heat and condensation resistant. It provides these without worrying that your hands will freeze or burn because the handle stays cool. The insulation in this mug is produced by hand blowing the glass carefully to make sure it works as it’s supposed to. The double wall creates an optical illusion to add elegance to your drinking experience. For you to share the experience with a friend or family, it comes as a set of two large coffee mugs. It has a large handle with a wide opening and thick stem to ensure that you hold it comfortably to experience its full sophistication. The WBSEos has a lid! 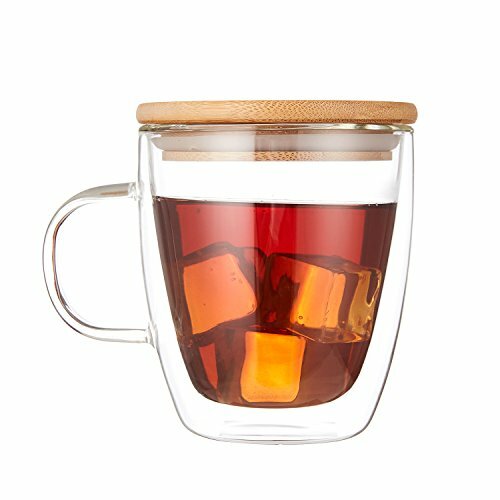 This makes it one unique double-walled glass as you can cover your hot coffee when you caffeinated enough until when you want some more, and it will still be hot. The wooden lid is composed of bamboo which is safe to use. It helps keep your drinks hot or cold for a long time. With a capacity of 13.5 ounces, it’s a great coffee mug for your long nights and office hours to avoid many refill trips. It’s composed of lead-free hand-blown borosilicate glass. Borosilicate is sturdy, heat resistant, and condensation resistant. This makes the WBSEos strong and durable. The process of making this glass is precise to make sure that the end product is smooth, crystal clear and seamless. The fact that the glass is heat and condensation resistant makes it perfect for taking your coffee as it will retain its original heat for long. The handle stays cool due to the insulation and is nicely connected to the glass without leaving any mold prints. The double glass gives you an optical illusion making your coffee look as if it’s floating midair. This adds a nice touch to your coffee drinking experience. This double walled coffee mug won the European iF Design Award in 2007 because of how carefully and precisely it’s made. It comes as a set of 2 coffee mugs each with a capacity of 10 ounces. It can be used to hold both cold and hot drinks without losing heat. This is because of the insulation between the two walls which ensures that the glass mug remains heat and condensation resistant. 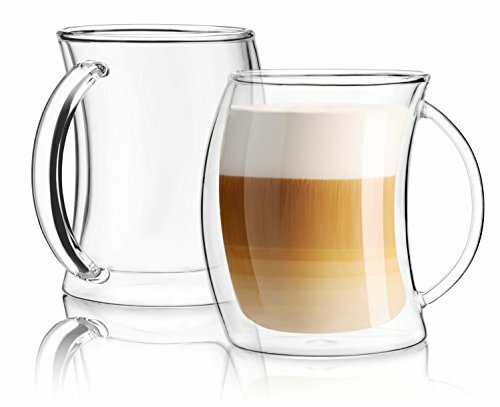 The Bodum Bistro glass coffee mug is made of lead-free borosilicate glass which is very durable and robust. The glass comes out as a crystal clear irresistible coffee mug with a brilliant optical illusion for you. It can be used to reheat your coffee in a microwave and can also be cleaned with your dishwasher because of the high quality borosilicate glass. This saves you time and makes your work easier. A) Size: The size of your glass mug determines how much coffee you hold at once. Make sure you buy the size that fits your demands. For example, if you’re an all-nighter, you should buy a glass coffee mug with more than a 10-ounce capacity. Mixing your glass sizes is also advisable because you will have options depending on how much or the type of coffee you plan to take. B) Material: The material used to make your glass coffee mug determines how durable it is. It also determines other factors such as how long it can retain your coffee’s heat. Borosilicate glass is one of the best materials used to make coffee glasses because it maintains heat, it’s lead-free, and it’s sturdy. Borosilicate is also able to withstand extreme temperature and does not produce any odors. C) Special features: Unique features such as having a double wall or a lid makes the glass coffee mug better. 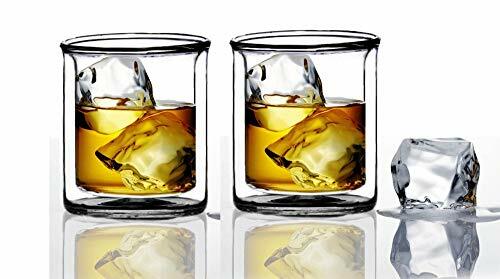 Double wall glasses retain heat for longer making them better than regular single walled glasses. 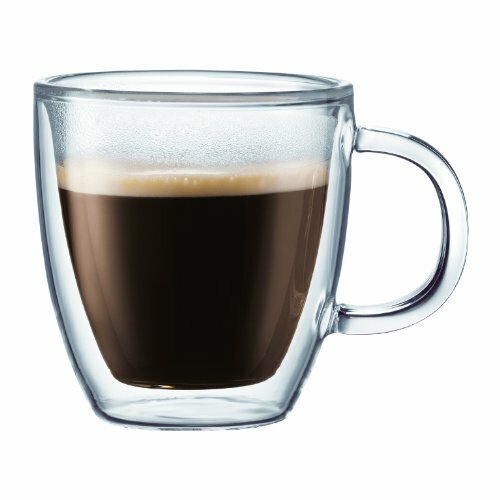 What’s the difference between double walled and single-walled glass coffee mug? The differences between double walled and single-walled mugs are few but of high consequence. 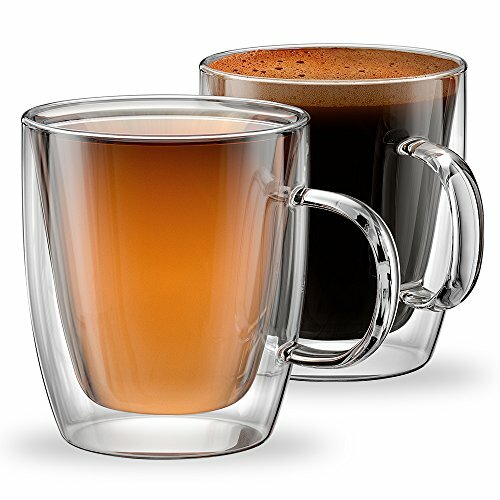 Double walled glass mugs are insulated to ensure that your coffee retains heat for long. 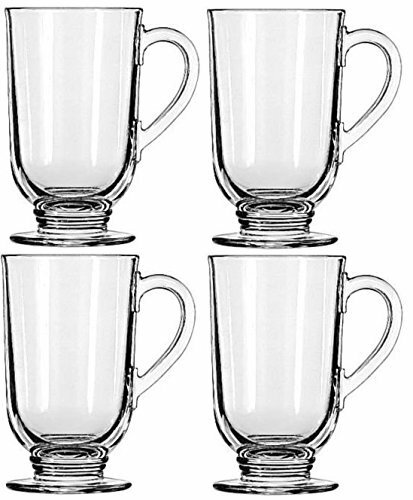 Single-walled glasses are uncomfortable to hold when they have coffee as the handles get hot or cold due to lack of insulation leading to heat loss. Why does coffee taste better in a glass mug? Coffee tastes better in a glass mug because glass does not produce any odor/flavor the way other mugs like a plastic based mug does. Because of this, your coffee retains its original flavor when using a glass mug. Can you put hot coffee in a glass cup? This depends on the glass material used to make the cup. Some materials are too thin and could shutter when you pour hot coffee in them. Other glass materials, such as the borosilicate glass, are strong and can handle extreme temperatures. Are all glass mugs dishwasher and microwave safe? Depending on the material, some are dishwasher and microwave safe while some are not. It’s always safer to hand-wash your glass coffee cups to maintain the design and prevent damage. Most are microwavable, but you should always confirm with the manufacturer to be on the safer side. You should, if you haven’t already, try a glass mug if you’re a coffee lover. They give you the next level experience when sipping your espresso, cappuccino or your favorite coffee because of their beautiful design and how fun they are to use. The right glass mug should hold just the right amount of coffee for you and should be made of high quality material to ensure its durability. The list above is a collection of high quality glass coffee mugs, and one of them may be your coffee buddy during those long hours at work. Pick the one that serves your specific coffee needs.